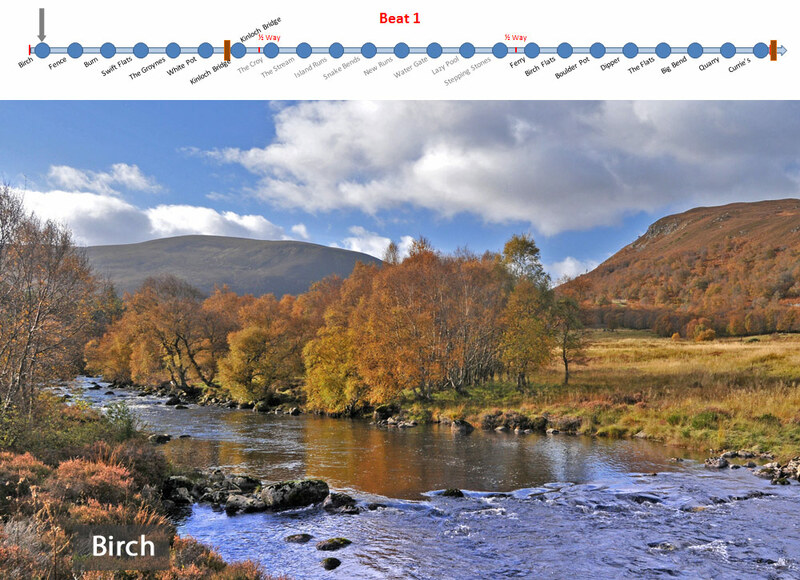 Beat 1 is the uppermost beat on the river starting a few hundred metres below Loch Morie. Technically, it is the longest of the Novar beats at 1.5 miles (3km) in length finishing at Strone Falls, but since 2013, the beat has been divided into upper, lower and middle sections. Normally salmon fishing guests will fish the upper and lower sections of the beat only. The middle section of the beat is slow moving with meanders, braided streams and islands providing excellent trout water, and it is reserved for that purpose in the early part of the season. From August onwards, the middle section will generally be unfished, and held in reserve to be used as needed to provide high water relief. For most of its length the beat lies in a wide open valley covered with heather moorland, coniferous plantations and native birch woodland, though the last part is much steeper, with fast water pools. While there are some good holding pools, for much of the season Beat 1 is primarily a ‘running’ beat, producing fish when salmon and grilse are travelling through to the loch. From early-September, salmon start to hold up here in numbers as the spawning season approaches. Fence, Burn, The Groynes and Kinloch Bridge are the most productive pools on the top half of the beat, all fished best in high water. On the lower half the Ferry Pool and Currie's are good holding pools and Boulder Pot and the Flats can also be very productive, but fish can be caught throughout the beat in late season and when conditions are favourable. We are slowly building an archive of video clips from each of the Novar beats. Click on the links below to see videos from Beat 1 on the SalmonQuestTV channel on YouTube. Each video will open in a new tab. Some of the shorter videos clips just comprise a brief tour of a pool; others include action footage of our guests playing and landing fish - enjoy! All videos are in HD and best viewed in full screen at 1080p HD setting. Follow Novar Beat 1 Photos on Pinterest.